Not least due to its reliability, the B53J should not only be suitable for office use, but also according to the manufacturer in the field of healthcare. 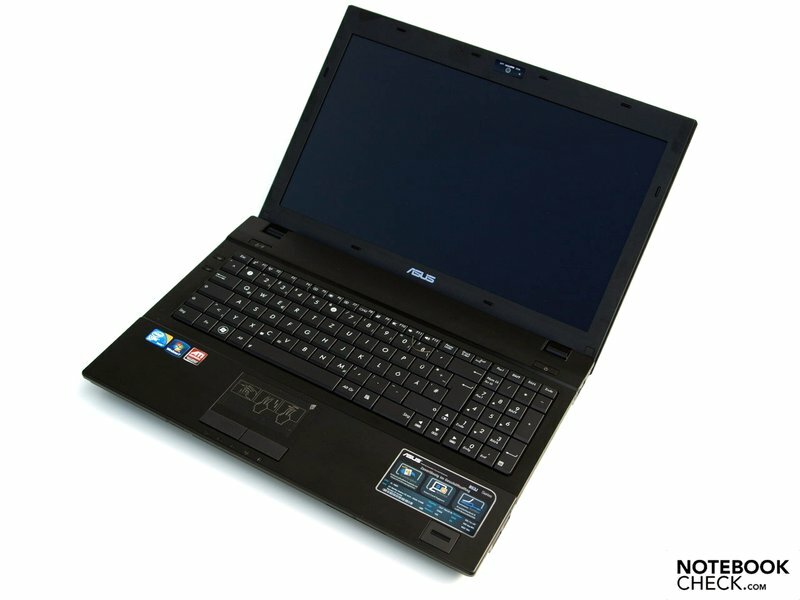 Along with comprehensive security and communictions features, this laptop has a Core i5-450M CPU, switchable graphics solution - GMA HD and ATI Mobility Radeon HD 5470, four Gigabytes of RAM, a 320 GB hard disk, and a 63 Wh battery. 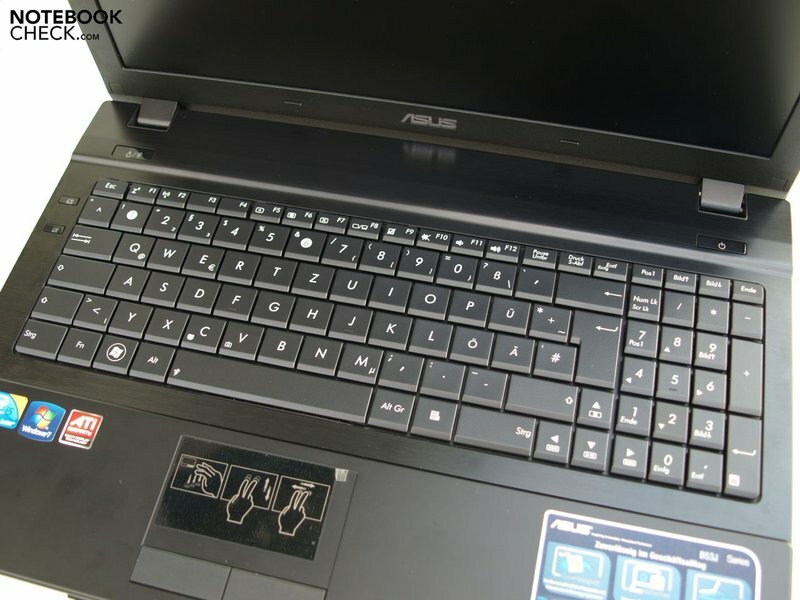 The completely black exterior of the Asus omits all non-functional decorations. 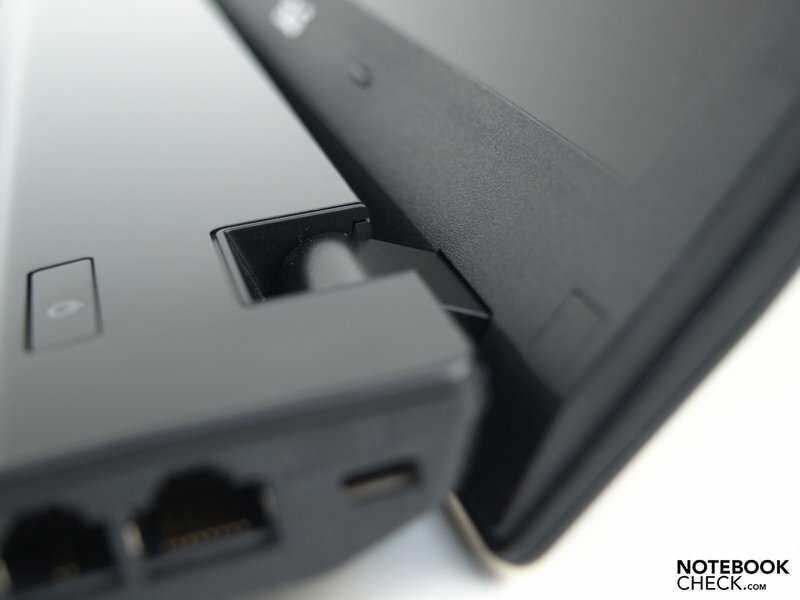 The case is partially made of scratch-resistant aluminium surfaces with excellent haptics. And although the palm resting area and keyboard are made of matte plastic, they nevertheless feel pleasant. Altogether the device is manufactured flawlessly, and makes a convincing case with its stability. Squeaking and other noises definitely don't make themselves noticeable when handling. 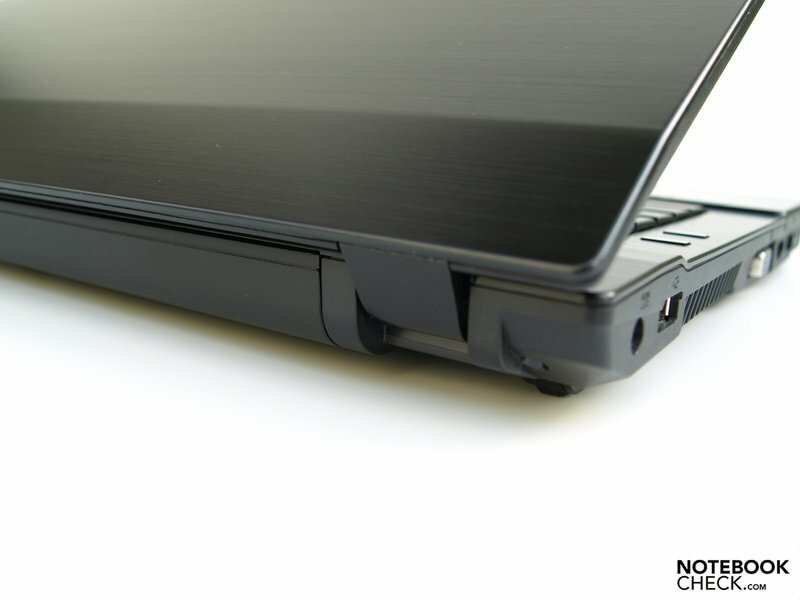 Due to the massive construction it is also possible to hold the laptop on the corner of the base unit without any real concerns. Although the display lid is relatively thick, it does give way when applying pressure with the finger, but this doesn't have any effect on the displayed images. A warp test carried out by lifting the notebook on the corner of the display should not be carried out frequently due to the total weight of the notebook. The display lid did bend marginally, and you can hear a creaking. The hinges are easy to turn, but the display still hardly teeters when adjusting the opening angle and is well supported in any position. Similarly opening the display lid with a single hand is easy to do. A locking transport mechanism for the lid was omitted. In addition the tension force from the hinges is not enough to hold the lid closed completely, when holding the B53J upside down on the base unit. 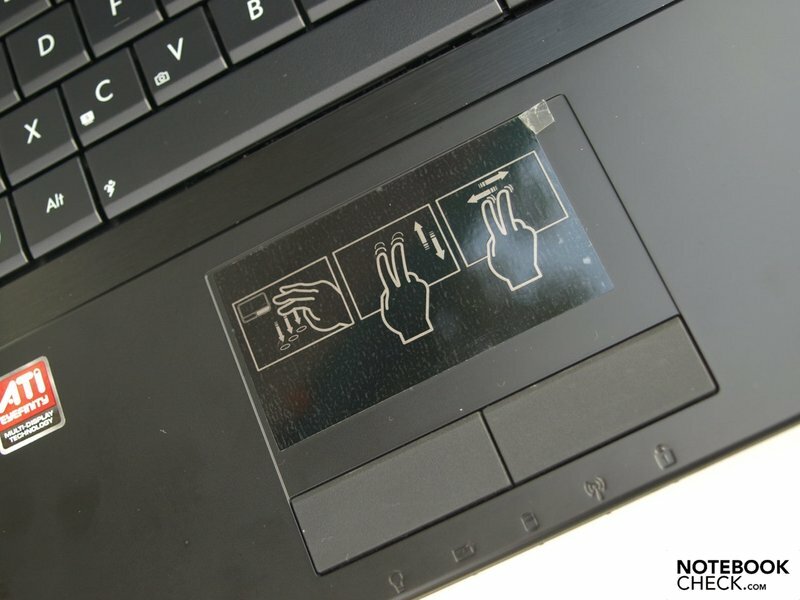 When transporting the notebook it is therefore recommended to take precautions to prevent items getting in the space between the keyboard and the display. The B53J offers three display outputs, the usual analog VGA output, a Display Port, and also HDMI. With the help of the Eyefinity Technology from ATI two of these display outputs are usable simultaneously. Up to three USB 2.0 ports are available for connecting peripheral devices. For faster data transfer to and from an external mass storage device one of these is a USB/eSATA combi-port. 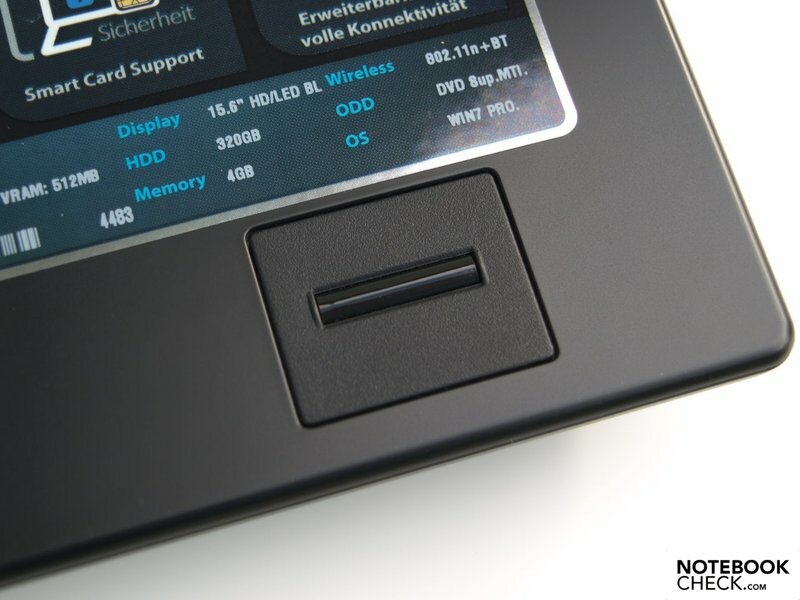 The arrangement of the interfaces is not ideal for left handed or right handed people, depending on which ports are used. All the video outputs are located on the left side from the front to the middle. 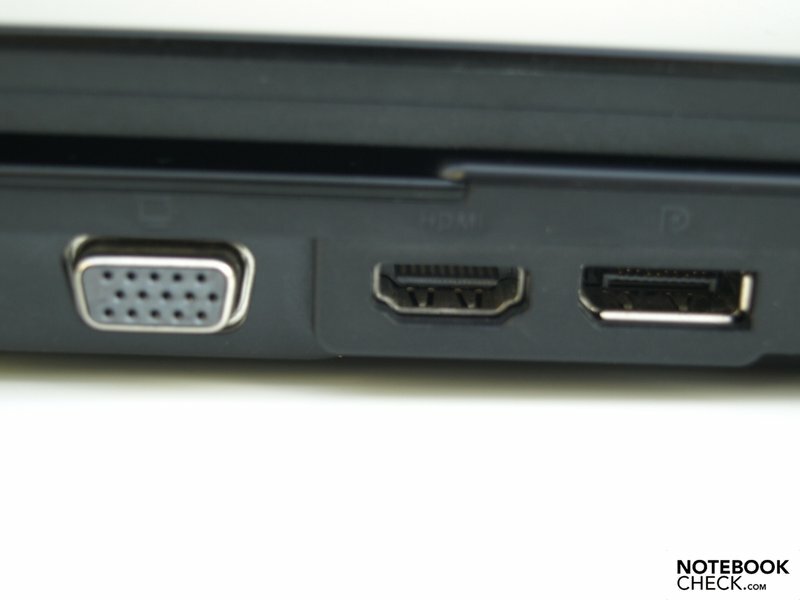 At the front on the right side there is a USB 2.0 port, and a USB/eSATA combi-port. 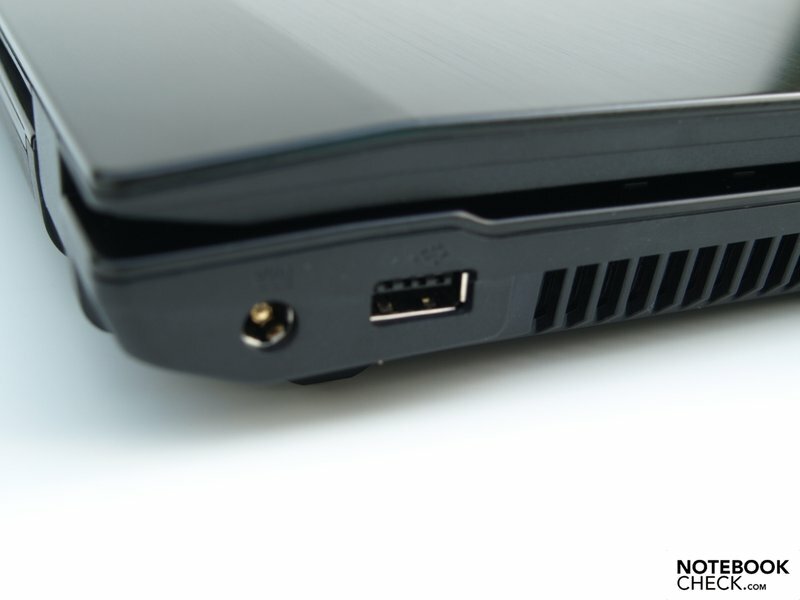 To make it easier to connect the B53J into a stationary working environment, a docking station can be connected to the docking port on the bottom of the B53J. It also simultaneously reduces the number of cables protruding from the sides. 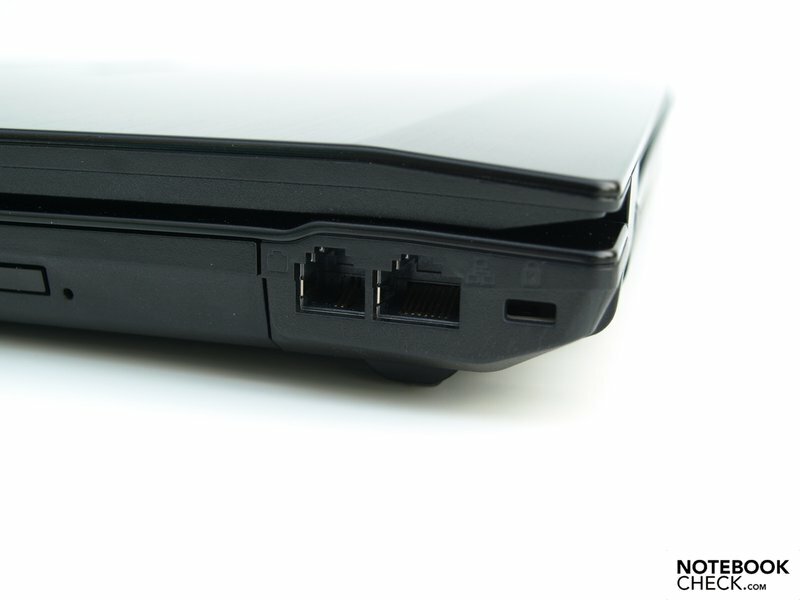 The communications features include WLAN (Intel Centrino Advanced-N 6200 AGN) and Ethernet (Intel 82577LM Gigabit Network Connection), as well as an RJ-11 modem connection (Motorola SM56 Data Fax Modem), and a broadband modem (Hamachi Network Interface). Security features include a finger print reader, a Kensington Security Lock, and a SmartCard reader. The B53J also supports hardware based encryption of data with the help of the in-built Trusted Platform Module (TPM). On top of this the notebook also supports the Intel VPro Technology, Intel Anti Theft Technology, and Computrace LowJack for re-acquiring lost devices (optional). 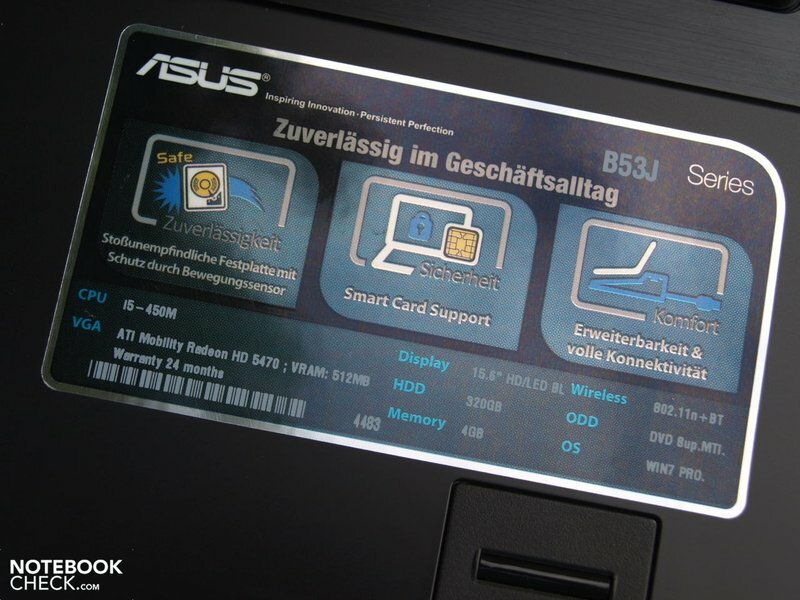 The shock-resistant hard disk also improves the data security, and the ASUS Secure Delete guarantees the safe deletion of sensitive files. 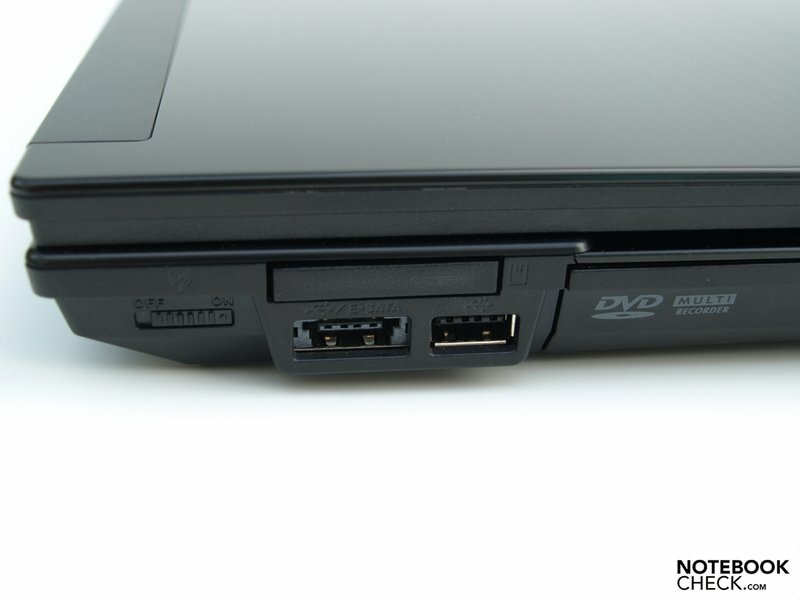 The accessories fortunately include an XP Recovery DVD and drivers, as well as Utility DVDs for Windows 7 and XP. The Recovery DVD for Windows 7 in contrast has to be created by the user with the help of a pre-installed tool. There is also a cleansing cloth, and a voucher for 25% off any Logitech products. 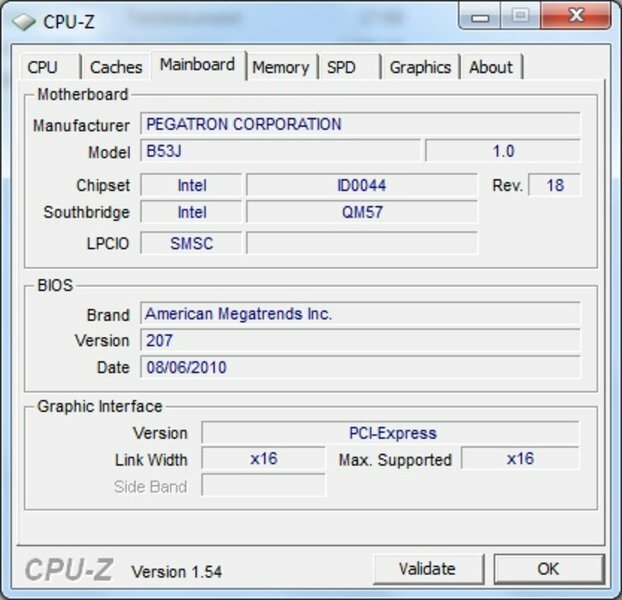 The B53J comes with Windows 7 Professional 64-bit pre-installed. There is also an option to downgrade to Windows XP. Additionally there is also a pre-installed Instant-On operating system called ExpressGate. This 15.6 inch notebook puts the width of the case to good use, and offers a keyboard that is waterproof against splashes with generously sized keys, and a return key that occupies two rows, as well as an independent number pad. Both of these adhere to the standard layout, although the key grouping does not provide an especially good oversight. The completely flat keys show good mechanical characteristics, with a medium length stroke, clear pressure point, and relatively quiet end stop. 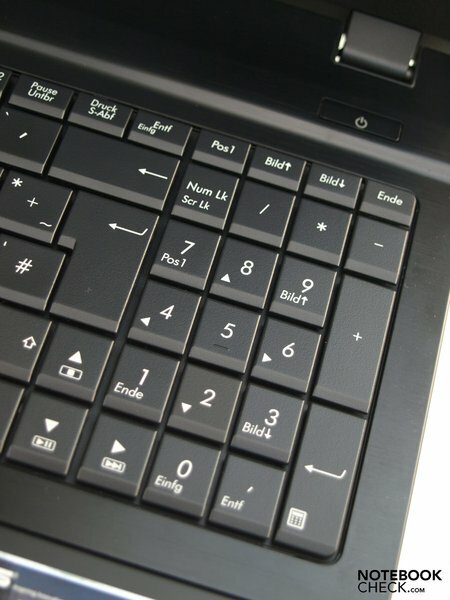 The status LED for the caps lock key is located directly next to it, the one for the NUM-lock key in contrast is located on the front edge of the notebook. 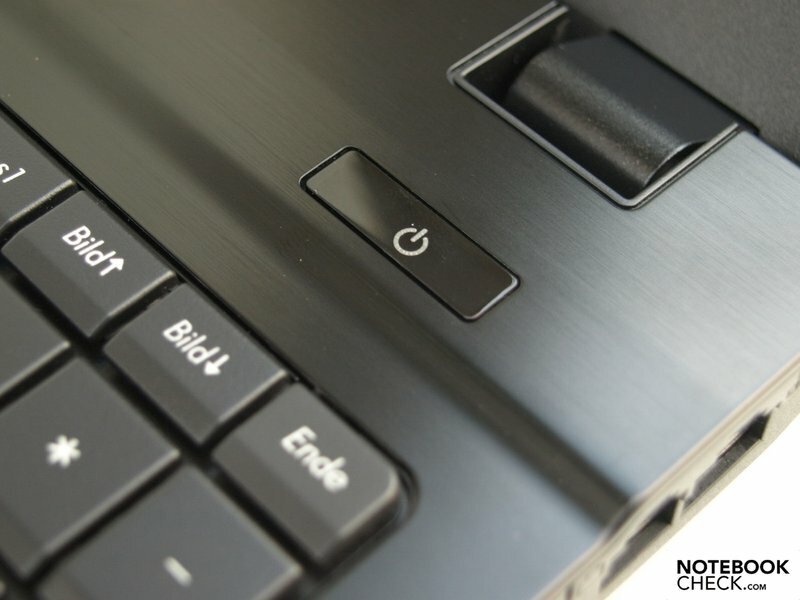 Next to the key for operating the touchpad, there are two further hotkeys; one of which is the already familiar ExpressGate button, with which it is possible to boot the notebook into the Instant-On operating system when it is switched off. 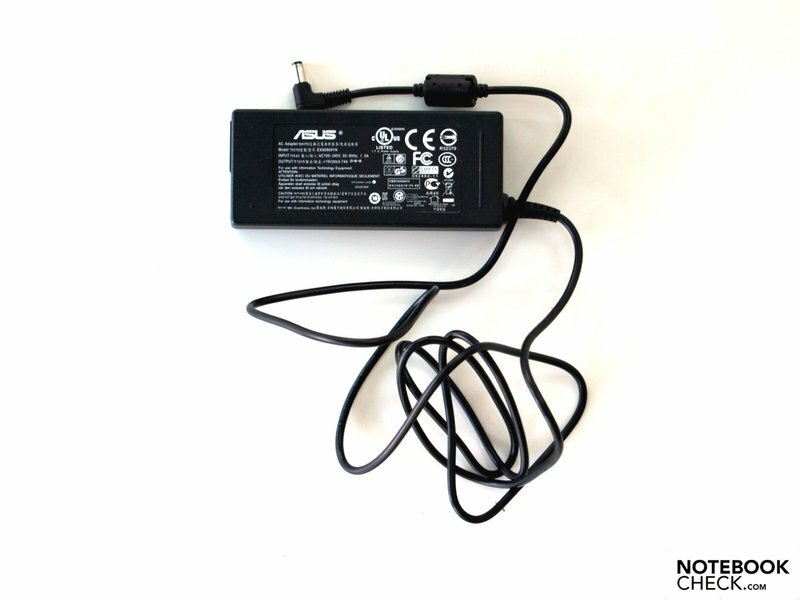 The other which is the 'Asus Scene Switch', with which it is possible to configure several options in relation to external monitors. 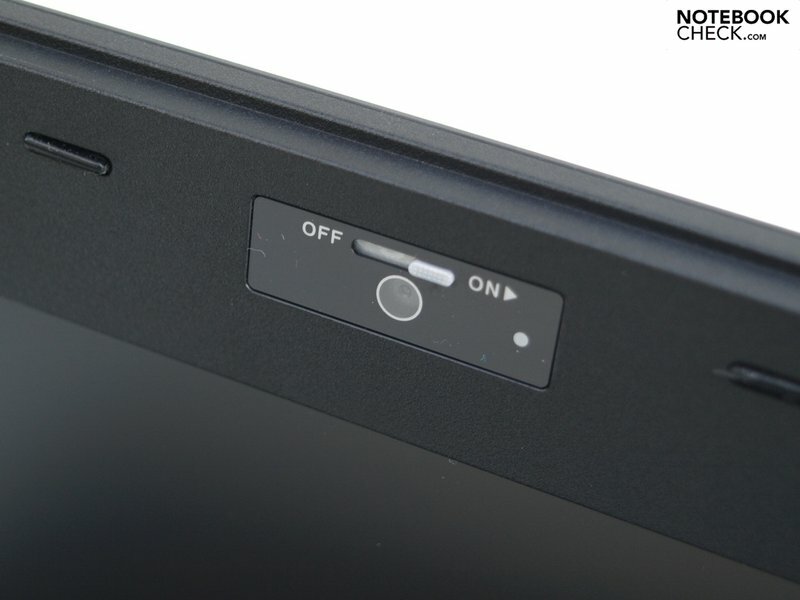 With the integrated touchpad it is possible to move the mouse pointer precisely and without effort. 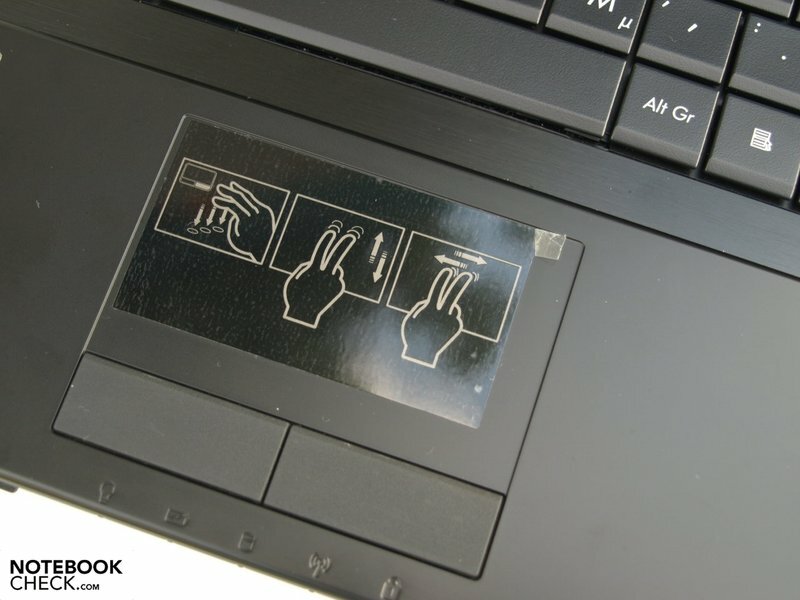 In addition the touchpad supports scrolling using two fingers. For this scroll zones were omitted. The touchpad surface itself is pleasingly sized, with a width of 80 millimeters and a height of 49 millimeters, and has matte smooth covering with little traction. 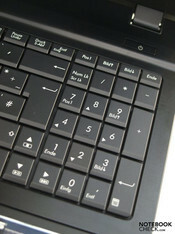 The touchpad buttons have a rubbery somewhat rougher surface, and feel comfortably grippy. The stroke length is relatively short. For those that would like to turn the touchpad off, this is possible with the help of the hotkey on the right side of the keyboard, or with the Fn-F9 key combination. 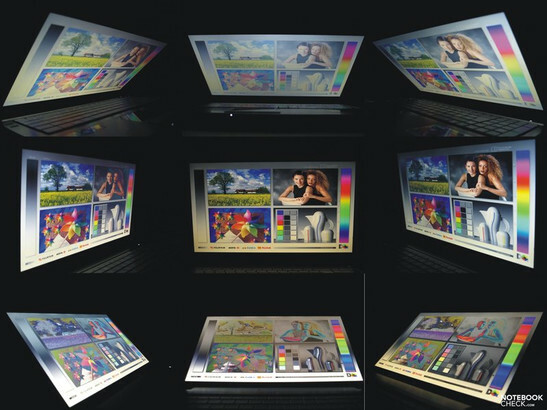 The integrated 15.6 inch display is an AUO23EC panel from AU Optronics, which has an HD-Ready resolution of 1366x768 pixels. With this it gives a cinema friendly 16:9 aspect ratio. In order to satisfy the demanding requirements of a work device, the surface is of course non-reflecting. Based on the results of the measurements it is possible to see that the LED illuminated display stays below the 200 cd/m² mark in all the picture segments. With an average brightness of 183 cd/m², the B53J does not belong to the laptops with the highest display brightness, but the levels produced are nevertheless ample for use indoors without any problems. With an illumination of 89% the brightness is very evenly distributed. The formation of shadows when displaying areas of single a color are definitely not visible with the eye. With a not especially low black level of 0,97 cd/m², and a maximum brightness for white of 189.9 cd/m² in the middle of the display, an also not particularly good contrast level of 196:1 is produced. Thanks to the matte surface reflections at least don't get too disturbing when using the notebook outdoors. While it is possible to work without problems in the shade, one would prefer to have a bit more brightness when working under direct sunlight. 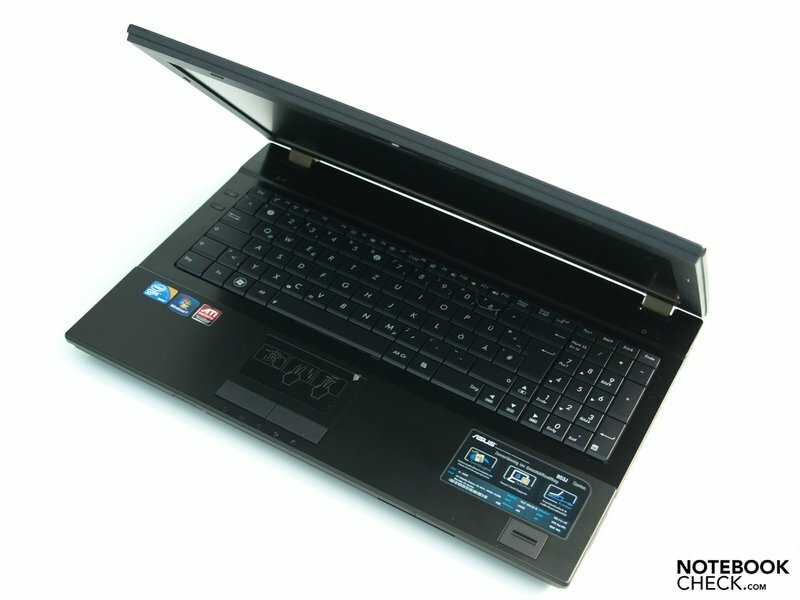 With respect to the viewing angle stability, the B53J does not distinguish itself from the mass of laptop competitors. Horizontally the working area stability is generous, but vertically it quickly comes to darker images when looking at the display from above or below, which is followed by discolorations. The DPC latencies stay in the green during the test. 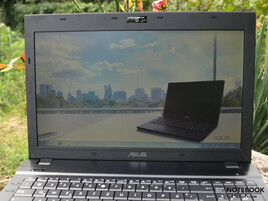 The Asus B53J is based on the QM57 chipset by Intel (-> manufacturer information). 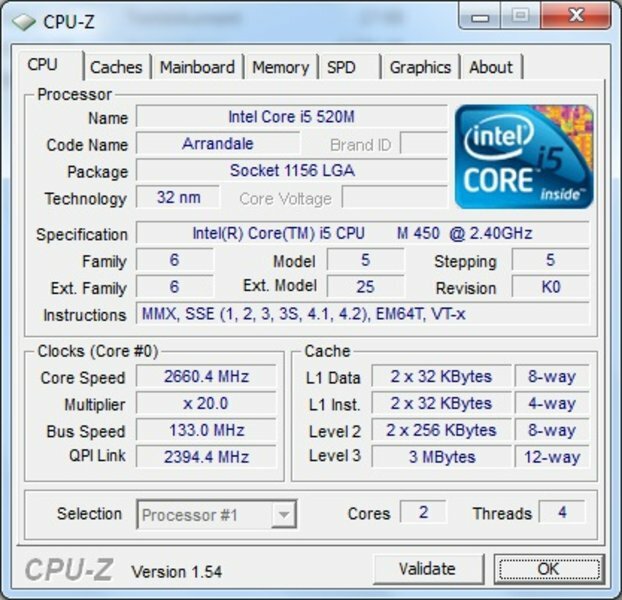 The Core i5 450M CPU by Intel is produced under the codename 'Arrandale'. 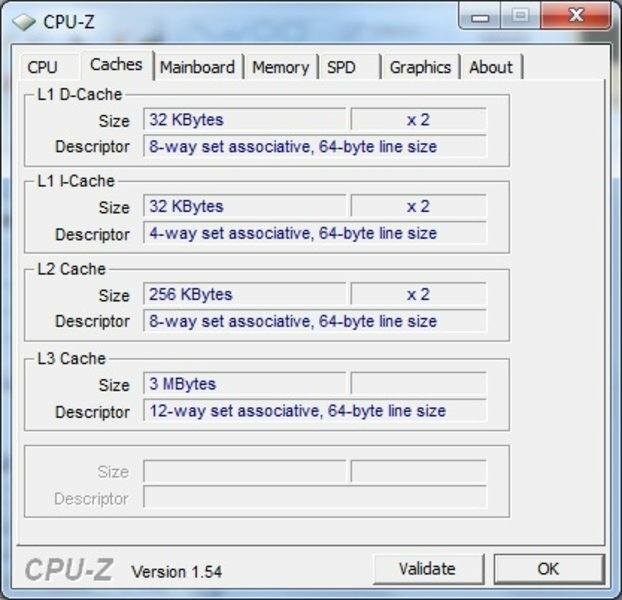 This dual-core processor supports the Hyperthreading technology, and can thus process four threads simultaneously. With the Turbo-Boost feature it is possible for the individual cores to be over-clocked depending on the workload. 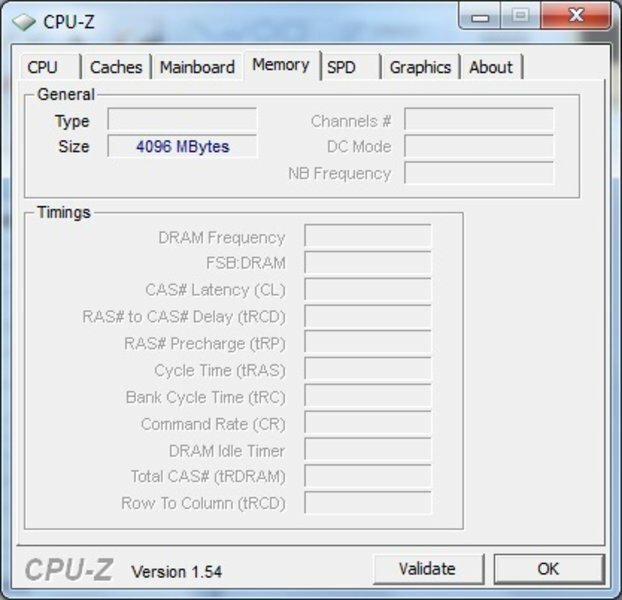 In comparison to expensive Arrandale processors, such as for example the i5-520M, the i5-450M does not have the AES functions activated though. In addition the CPU has an integrated memory controller, with which it can address up to 8 Gigabytes of RAM, and an integrated GMA HD graphics chip. But our device does not have to make due with an integrated graphics chip. For more demanding 3D applications, users can manually switch to the additionally integrated Mobility Radeon HD 5470 graphics card by ATI. With the latter of these the B53J reaches a respectable performance level of the lower mid-range with respect to 3D graphics performance, although the energy efficient GMA HD can be used for saving power. The integrated four Gigabytes of RAM are used efficiently with the pre-installed 64-bit operating system. For those that require more RAM capacity, and would like to increase this personally, can do this without difficulty via the maintenance panel on the bottom of the notebook. 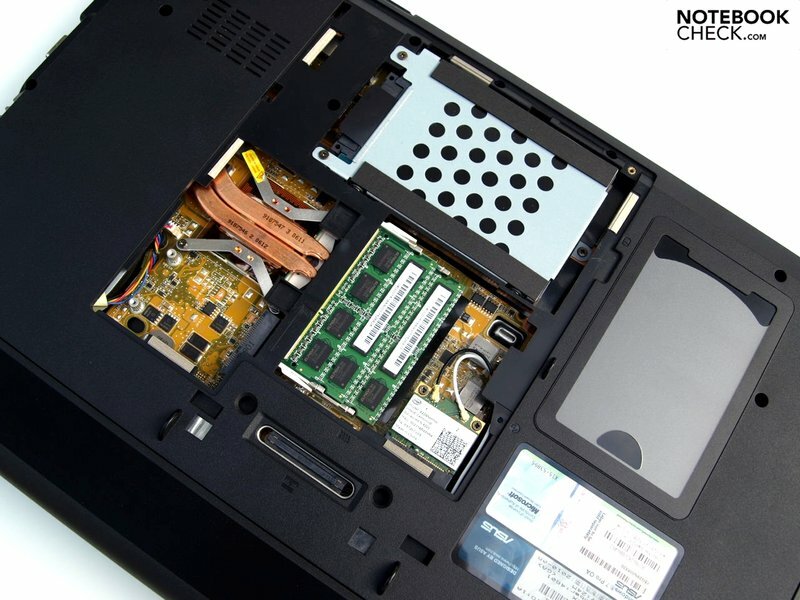 However, both of the slots are already occupied, so that at least one of the RAM modules would have to be replaced. The following performance tests were all executed with an activated HD 5470 graphics card. 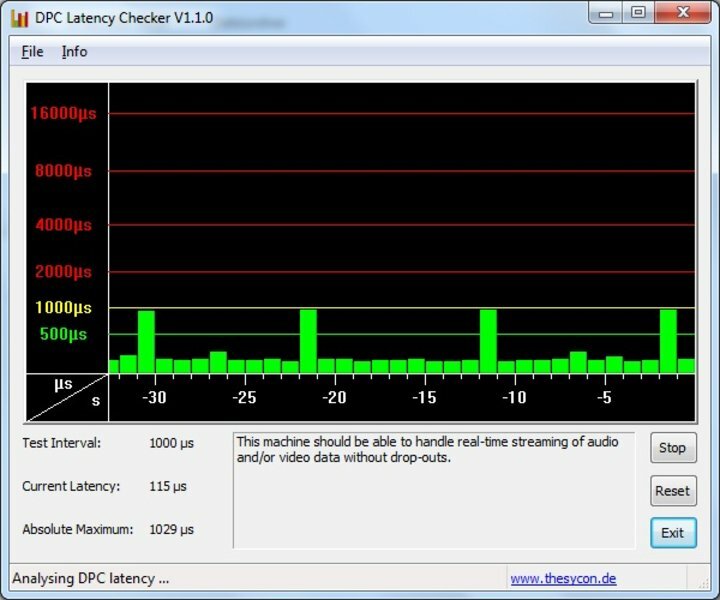 The application performance is evaluated as usual with the help of PCMarkVantage tests. It is more dependant on the combined performance of the individual components working together than on the graphics performance. The B53J lies in roughly the same territory with similarly equipped business notebooks. 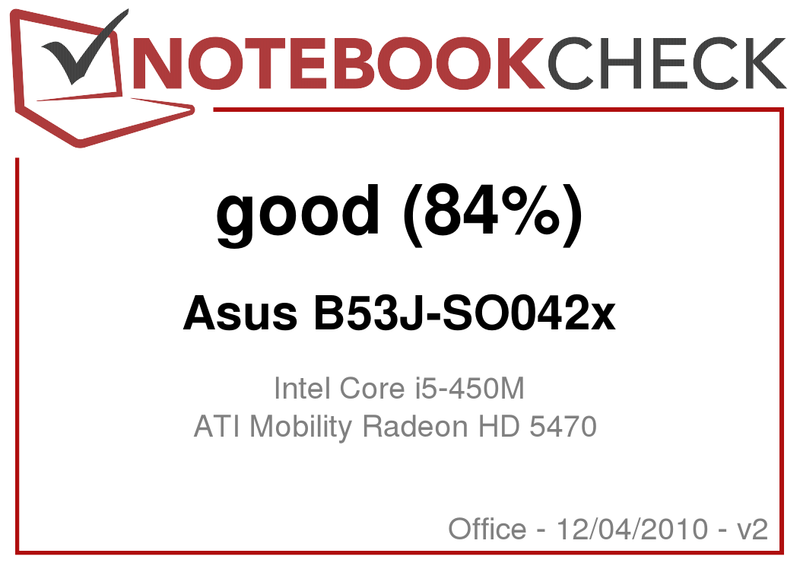 With a total score of 5516 it for example only scores 3% less than the Acer TravelMate 8572TG (Core i5 430M, GT 330M, also switchable graphics) and the Tecra A11-125 (Core i5 430M, GMA HD), but surpasses the Dell Vostro 3500 (32-bit, Core i5 430M, GeForce 310M) by 3%, and the HP Probook 6540b (32 bit, Core i5 430M, Mobility Radeon HD 4550) by 9%. In order to be able to assess the graphics performance, we first of all looked at the synthetic 3DMark test. Here the B53J of course surpasses laptops with a GMA HD graphics chip, such as the Toshiba Tecra A11-125 already pointed out above, which still had a slight advantage when assessing the application performance. The TravelMate 8572TG (Core i5 430M, GT 330M, also with switchable graphics) which was also mentioned above performs better and worse when it comes to graphics, depending on the specific test. 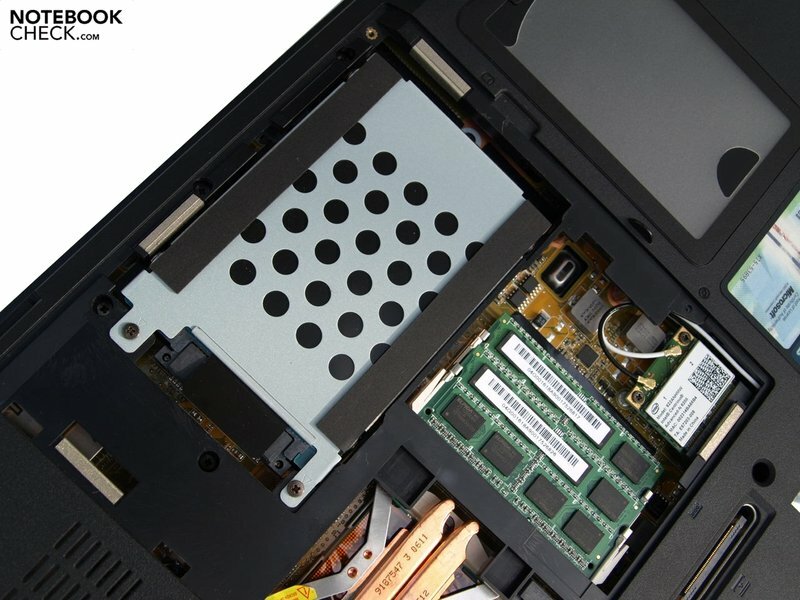 The two 32-bit systems Dell Vostro 3500 (430M, 310M) and HP Probook 6540b (430M, HD 4550) lie roughly in the same territory as our test candidate in this respect. 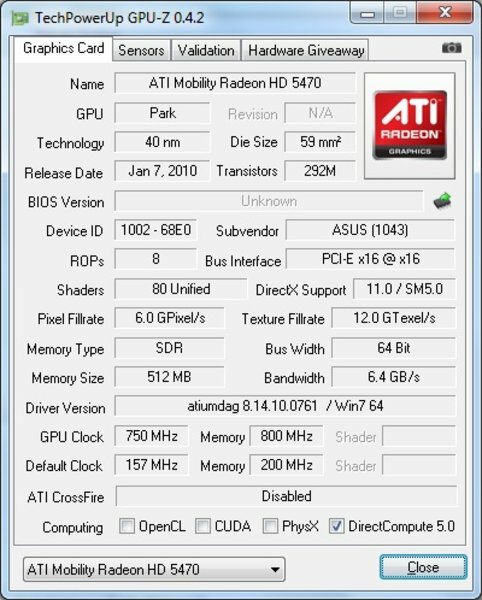 Even with an active ATI Mobility Radeon HD 5470 graphics card it is not recommended to expect too much with respect to 3D performance. We took a closer look at this with the help of three selected modern 3D demanding games. These are, if at all, for the most part only smoothly playable when compromises are made with respect to resolution and details. In many cases it is even necessary to tweak these to the lowest available setting. 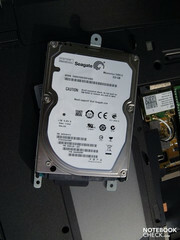 The integrated hard disk is a ST9320325AS from Seagate. This has a total capacity of 320GB, and has a rotational speed of 5400RPM. The results established by tests with HDTune didn't provide anything especially conspicuous. As an optical drive there is an HL-DT-ST DVDRAM GT32N available. When using the B53J with little utilization, for instance when working with office programs or surfing the internet, the B53J is relatively quiet with a maximum system noise of 35.8 dB(A). Similarly the noise emitted by the hard disk also remains in the green area with 35.8 dB(A). When running with a high level of utilization the average noise emitted rises to 42.1 dB(A). During our several hours stress test this value escalated to a maximum of 45.8 dB(A). Due to the mid-frequency of the humming whirring of the system noise, this does however remain marginally acceptable. The absence of any noticeably conspicuous variation in the cooling system noise fluctuations also helps improve the general noise perception. The surface temperature when running with a low level of utilization also consistently remains in the green area. In contrast to when utilizing the components excessively. In this scenario the top surface temperature stays below body temperature. On the bottom surface in comparison the temperature rises to a maximum of 45.2 degrees Celsius following several hours of the stress test. A permanent 100% utilization of the graphics card and processor over several hours is however not a likely real world scenario for this laptop. Even with demanding sophisticated 3D applications, it is rare to encounter such utilization levels over prolonged periods of time. Fortunately the temperatures inside the case after 12 hours of the stress test remain in the acceptable range. Thus the HD 5470 temperature rises to a maximum of 77 degrees Celsius, and the CPU cores don't get hotter than 87 degrees Celsius. A subsequently performed 3DMark test additionally confirms, that there is no need for throttling the performance. (±) The average temperature for the upper side under maximal load is 34 °C / 93 F, compared to the average of 29.4 °C / 85 F for the devices in the class Office. (+) The maximum temperature on the upper side is 38.8 °C / 102 F, compared to the average of 33.9 °C / 93 F, ranging from 21.2 to 62.5 °C for the class Office. The two loudspeakers are located left and right below the front edge. The maximum volume is rather low, but should be sufficient for small rooms. Since there is no sub-woofer to back these up, the sound lacks bass frequencies, as can be expected. For less demanding background music it is however sufficient. In cases where this is not enough, the 3.5 mm headphone output also supports S/PDIF according to the manufacturer. The B53J is supplied with a Lithium Ion battery with a capacity of 63 Wh. Note: the Sonata batteries from Boston Power with a warranty of 3 years (min. 900 charge cycles with full capacity) are so far only available for the B53J in the US. 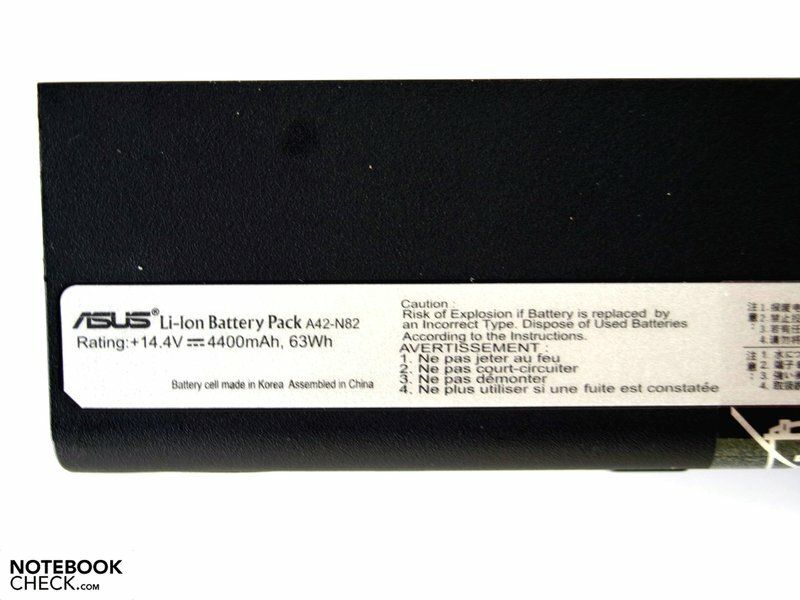 The battery life varies according to the level of utilization and graphics resolution between a minimum of only 78 minutes with active HD 5470, high performance profile, maximum brightness, and an enabled WiFi module; and a maximum of about five hours, with active GMA HD, energy saving profile, disabled power consumers, and minimum, but for regular use insufficient, brightness. Both of the practical tests were carried out with an active GMA HD, since its performance is also sufficient by far even for the video test. We were able to get approximately two and a half hours of movie from the battery, using maximum brightness, high performance profile, and disabled WiFi module. During our internet browsing the battery was empty after three and a quarter hours with the same brightness level but activated energy saving profile. One advantage of the B53J is its switchable graphics solution, with which it is possible to adapt the performance and battery life to the momentary requirements of the user. The user must do this manually by selecting the right mouse button on the desktop, and selecting 'Switchable Graphics Configuration'. Although it is possible to configure the B53J to automatically enable the 'energy saving GPU', this only works if practically all the applications are closed. 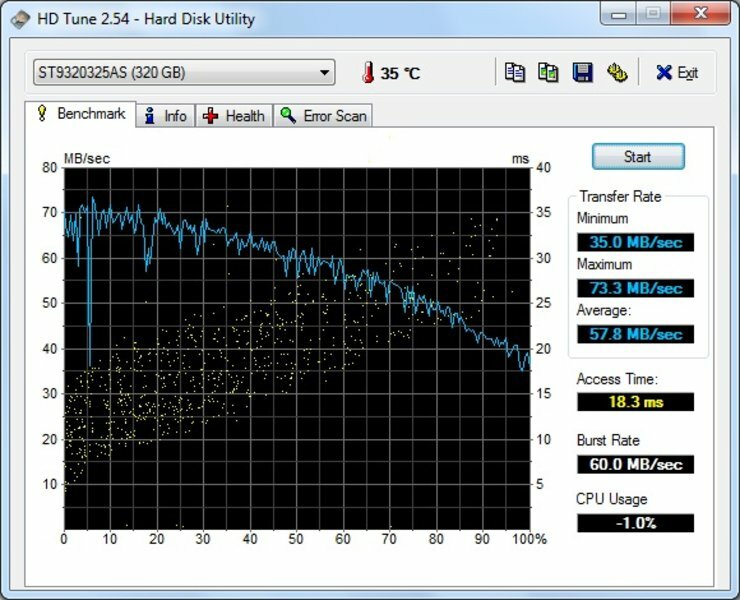 When using the B53J with a low level of utilization it is possible to save between 11% and 40% of the power consumption with the GMA HD compared to the HD5470, when running with a high utilization level this rises to between 18% and 38%. In the table below the values of the GMA HD were entered for the idle scenarios. 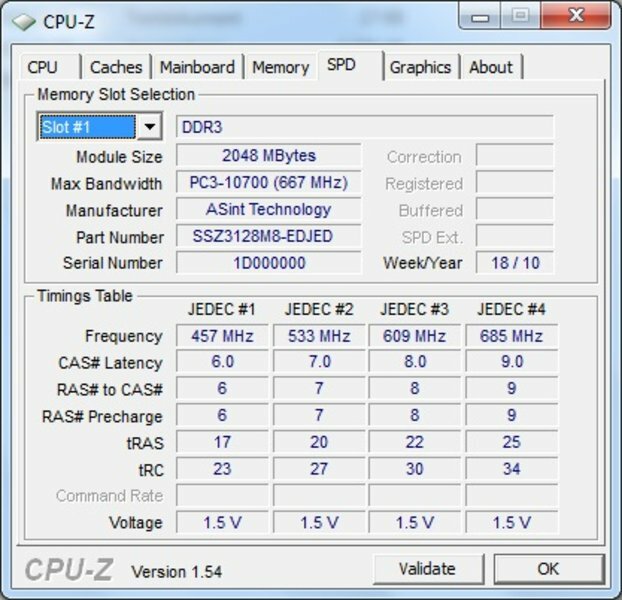 The values for scenarios with a high load are those recorded for the HD 5470. 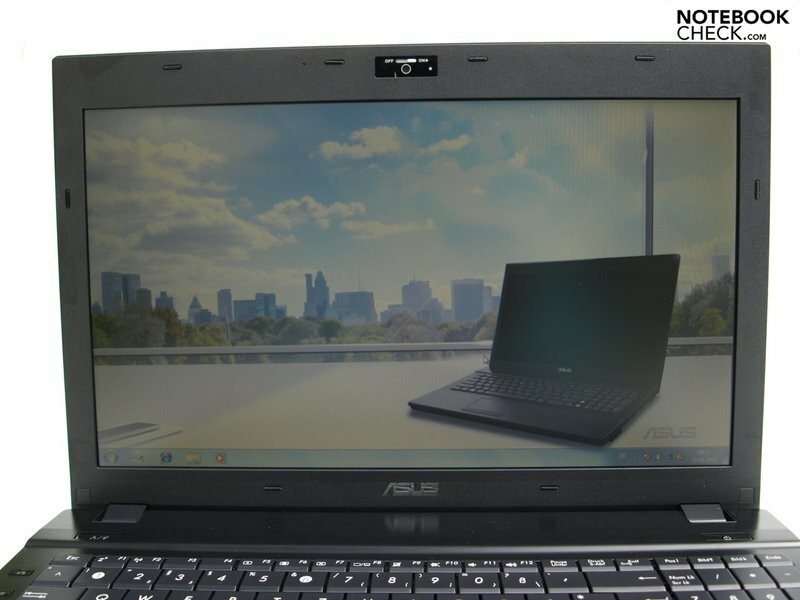 With its timeless elegant design and good level of stability, the Asus B53J is suitable for hard daily business use. It is apparent that reliability and longevity were two of the main priorities. 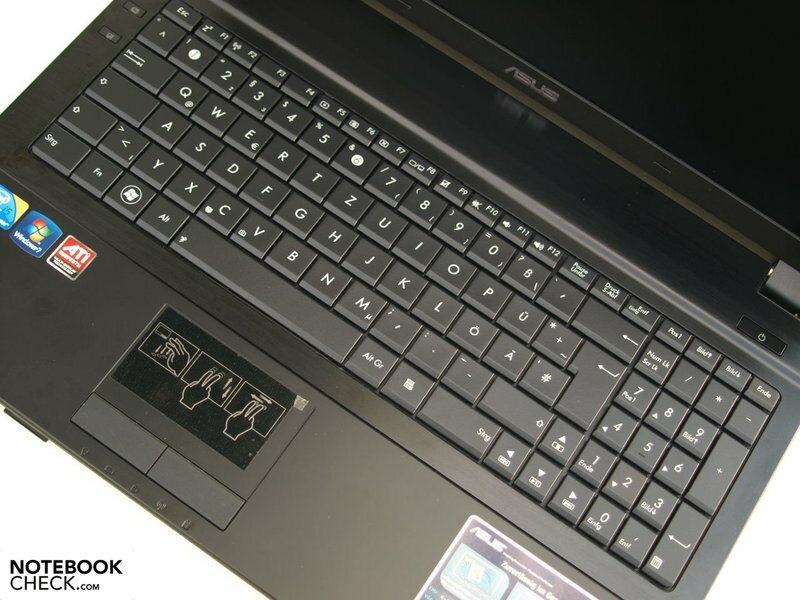 Keyboard and touchpad are ideally suited for longer working hours with the laptop. 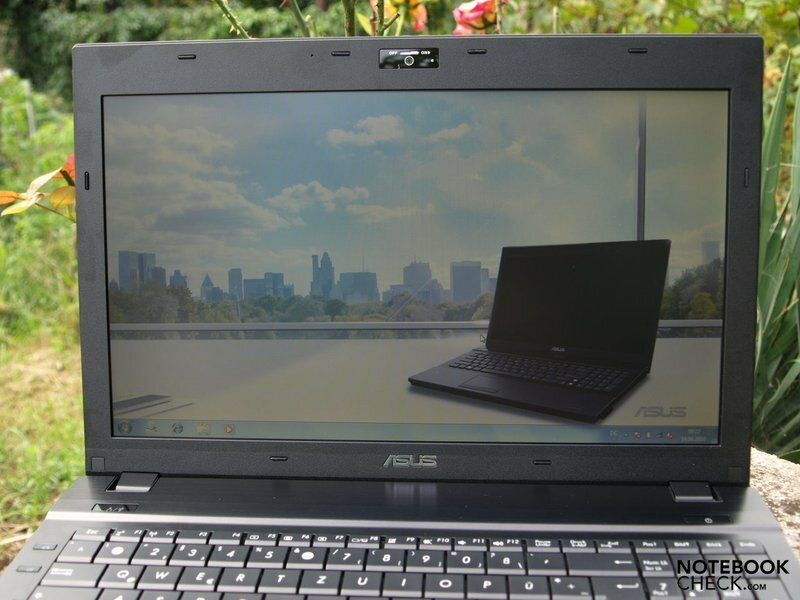 The matte display prevents disturbing reflections, and is therefore not only easy on the eyes, but also well suited for use as a work display - which should be expected from business notebooks though. When used in particularly bright surroundings, for example under direct sunlight, a bit more brightness would be favorable though. In addition the comprehensive security and communications features are positive aspects. With the ATI Eyefinity Technology it should be possible to easily use several displays at the same time for working, and hence also increase the size of the desktop appropriately. 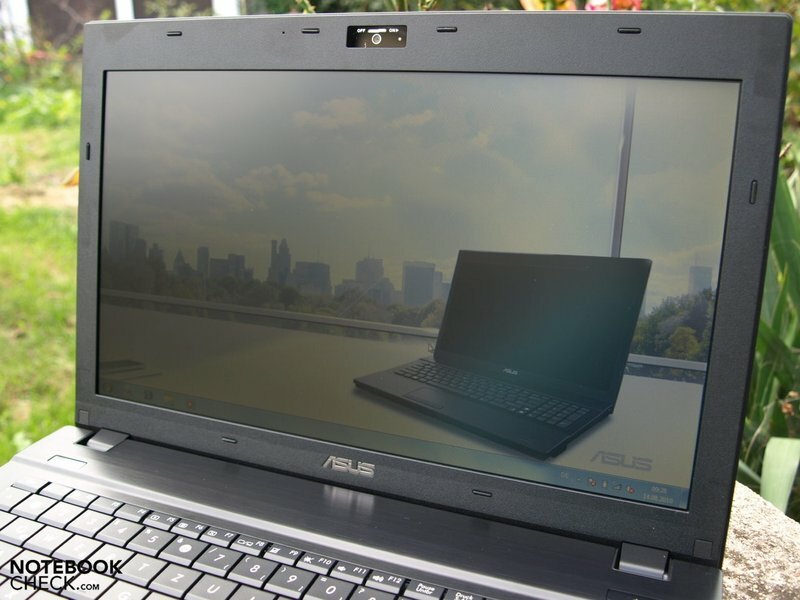 So that several displays can also definitely be connected, Asus B53J offers three video interfaces, two of which are digital. Altogether the B53J leaves a good impression, and satisfies the requirments for its intended area of use as a business notebook. Additionally it also scores with good value for money. 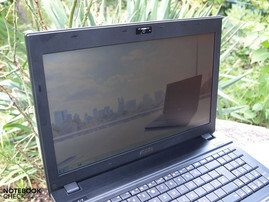 Business laptops in the 15 inch format, such as the Acer TravelMate 8572TG also with switchable graphics card, the Dell Vostro 3500, the HP Probook 6540b, and the Tecra A11-125 with GMA HD graphics.